For the game’s first 15 minutes, both teams defended well and the Deacs and Tigers appeared to be evenly matched. Wake Forest applied some pressure early with individual plays by sophomore Ema Twumasi and senior Jon Bakero. The Tigers had a great opportunity early with a steal on Wake Forest’s defensive side that led to a one-on-one against Cases Mundet, but the defense recovered early to make an accurate tackle. However, neither team seized the control of the match early. As the game progressed, the Demon Deacons increased their ball possession and started to create offensive plays with more consistency. During one of those offensive opportunities, freshman Brendon Servania crossed a perfect corner kick to Bakero shot for a great defense by Clemson’s goalkeeper Ximo Miralles. The game then settled down, with Wake Forest creating offensive plays through ball possession, whereas Clemson through counter-attack opportunities. 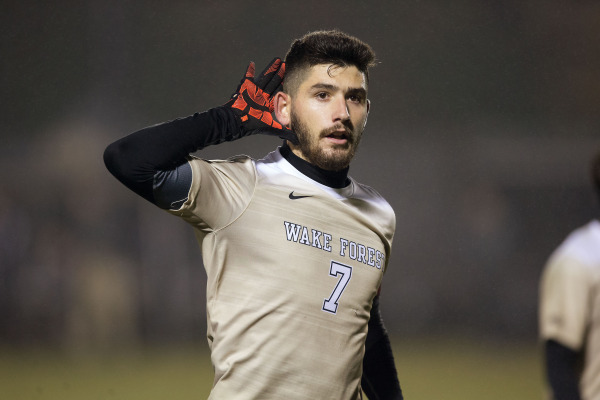 At the 31-minute mark, Bakero created a marvelous play after dribbling through two defenders and cleaning up for his shot attempt that was well-defended by Ximo Miralles, but freshman Omir Fernandez scored on the rebound to open up the scoreboard for the Deacs. At the end of the first half, the Wake Forest Demon Deacons led by 1-0 against the Clemson Tigers. It was a pretty even matchup during the first period. Despite the statistical edge to the Deacs, the Tigers scared the crowd a couple times with their counter-attacks. Wake Forest found success creating play through the laterals exploiting the speed advantage they have there. In those situations Twumasi moved a couple of times to the left, creating a favorable match-up there, and with his explosiveness and ball control he easily turned the corner against a slower defender. Starting the second half, the Demon Deacons carried out the momentum of their first goal, establishing pressure on Clemson from the first minute. However, Wake Forest did not seize on its opportunities and Clemson grew confidence as the second period progressed. During one of Clemson’s counter-attacks, Harrison Kurtz crossed to Saul Chinchilla on the right side of the box and the Clemson midfielder sent it to the back of the Wake Forest net to make it 1-1 with 21 minutes left. At the 76-minute mark, Clemson’s Justin Malou fouled hard on Bruno Lapa in the middle of the field and was automatically ejected with a red card. It was a total gamechanger, as the Deacs recovered the momentum of the game. With one player down, the Tigers had an opening at the middle of their defensive side of the ball, and after Ximo Miralles came down to fill out that void to prevent a would-be score, but Jon Bakero opportunistically took the rebound and scored on a long-range shot. After Bakero’s score, the Demon Deacons gladly exchanged passes on offense to secure the win and advance to the ACC championship final. Overall Wake Forest played well. Offensively, though they failed to seize on some opportunities, it also speaks to a great defensive effort by Clemson today, especially on the first half. Defensively they did a solid job, especially taking into consideration the absence of 2017 ACC defensive player of the year Kevin Politz, who is likely to be out for the remainder of the season due to a knee injury. Following the game, coach Muuss gave his remarks on the match and on the upcoming matchup against Virginia for the ACC championship title. No team has repeated, since Maryland [2012-2013] season as ACC champions, is that important for you guys on Sunday? Muuss: I didn’t know that. I know no Wake Forest team has ever won back-to-back ACC championships, and you heard me say we [want to] create new history with this season. This is the only second time Wake Forest has ever been to back-to-back finals. But we have our hands full with Virginia. It is a fresh team from the ACC that we haven’t seen this year. They are extremely athletic and extremely organized. We have our hands full. Last time you guys played Clemson, the game was also tied in the first half, and Wake Forest also scored the game-winner. How does the team stay unfazed? Muuss: I was fazed (aughing). I can tell you that. For me the game was different. I feel we were in charge for the first half. I think we [allowed] one shot to Clemson. That’s incredible. When they scored it wasn’t as late as last time, when you’re like “Oh my god, what just happened?”I think we had time to regroup. I don’t think the second half was great soccer, but they [Clemson] are a good team. I’m just proud of the way the guys responded after letting up a goal. Looking forward to Sunday, talk about some of the challenges going up against UVA. Muuss: You know something? I have been watching UVA. Just for fun. You know if they play on a Friday and we play on a Saturday or vice-versa, you watch some ACC games just to see what is out there. Obviously, they have very talented players in every position. They are athletic and they can get forward with the best of [the ACC]. They have a very good group of defenders and I think they have one of the best goalkeepers in America. With 2017 ACC Offensive player of the year in Jon Bakero, three times in a row ACC coach of the year in Bobby Muuss, and five players winning all-ACC honors, Wake has a roster as talented and well-coached as you can find anywhere. The fact that they have been able to overcome the absence of Kevin Politz and Eddie Folds and still manage to beat No. 5 in the nation Clemson, speaks a lot about their “next man up” mentality. Wake Forest is headed to the most important game of the season so far, with a chance, as coach Muuss emphasized, to make history this Sunday. The Wake Forest Demon Deacons will face the Virginia Cavaliers at noon in Charleston, SC this Sunday. The game will be broadcast on ESPNU. Stay tuned for more updates and coverage on the Wake Forest men’s soccer team.